Some time ago I was enjoying an Imperial Red Ale brewed by a good friend of mine at his place in Amsterdam. That was when George first slipped the Hopsylvania name into the conversation. Despite being a beer enthusiast at the time, I had not yet gotten into homebrewing myself. 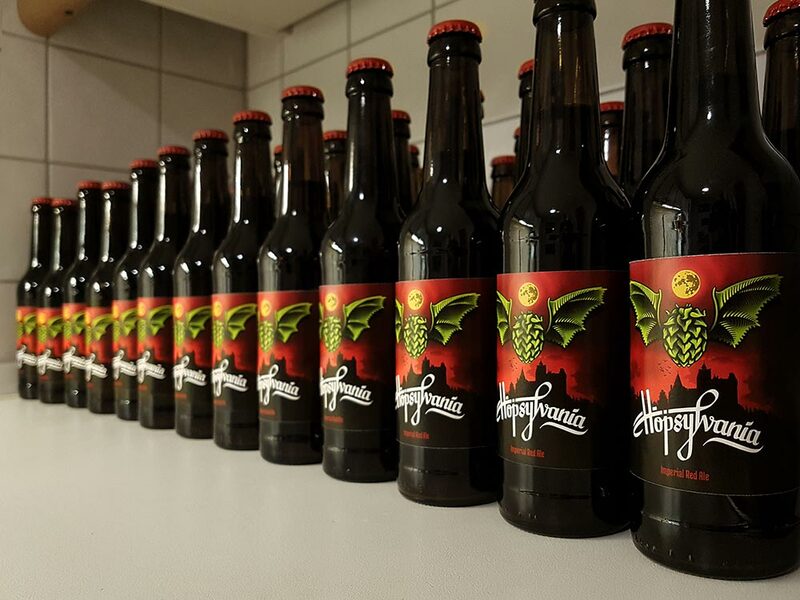 Now, almost two years have past and I have just finished labeling a sixty bottle batch of the very same Imperial Red Ale, brewed from the same kit and branded as Hopsylvania. It was around New Year’s 2015 when we went to spend the end of the year at our friends’ place in Amsterdam. 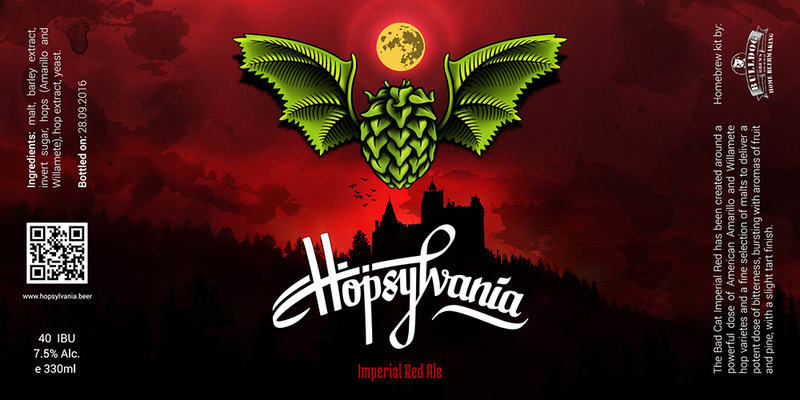 That’s when the Hopsylvania name first surfaced, and it was how my friend wanted to name his IPA, when he would have his own personal recipe ready. My enthusiasm immediately kicked in and I could already picture the first concept for a bottle label. A winged bat! I’d sleep on this idea for a while until at some point I figured it’s time to put the pencil to work. Almost a year later I started working on the label and came up with a very rough prototype. This was the exploratory phase. 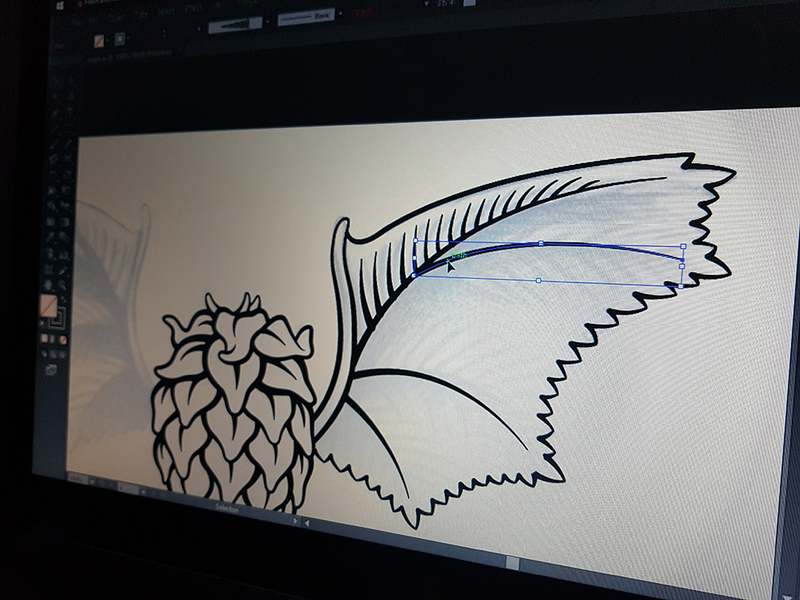 The only thing I knew for sure at that point was that there was going be a hops cone with bat-like wings made out of leaves. The rest—such as layout, colors and most importantly typography—I still had to figure out. Though initially I was set on using a standard typeface, I quickly realized that this wasn’t going to suffice. I wanted something special, something custom. George’s birthday was coming up and I wanted to at least have a first draft of the label by then. 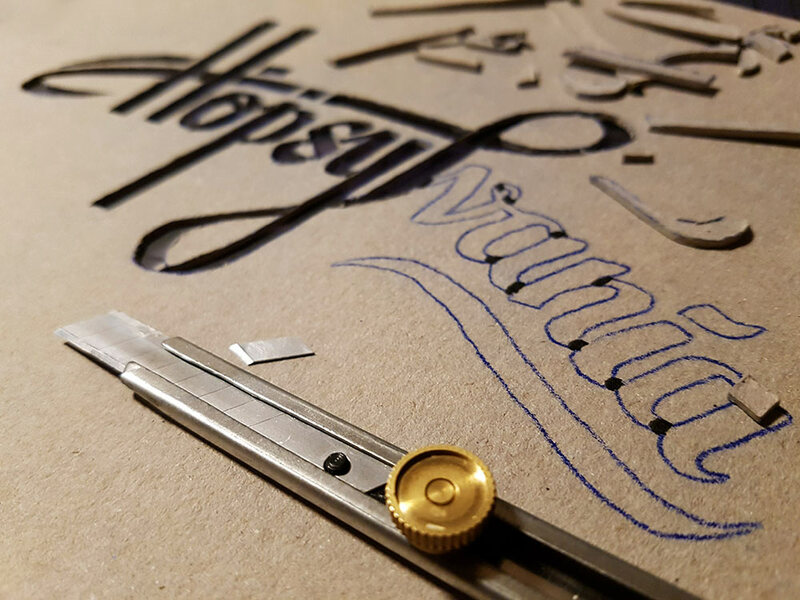 After browsing the web for inspiration I decided that having a hand-lettered logotype would add that nice personal touch I needed for the entire project. I started off by trying out different pencil techniques, however nothing really looked natural, it lacked flow and consistency. Having shown a couple of those sketches to my designer counterpart at TrustYou, I ended up borrowing a few of her calligraphy pens and gave it another try with those. It didn’t make sense to struggle using a pencil to try and mimic brush stroke variations when I could just as well use an actual flat tip pen to achieve a more natural and accurate result. Going through a few pages of trial and error, my sketchbook became full of failed attempts at different letter shapes, ligatures, stroke widths and angles, until I finally found the style that I was looking for. By that point all that was needed was for me to draw a single, smooth, mistake-free version that I could digitize. Since I was entertaining the idea of trying out Affinity Designer for quite some time, I figured this would be the ideal moment to take it for a spin. My plan was to have the logotype finished by the time my first homebrew batch was ready for bottling, so that I could use it in the label design. Things didn’t go as planned and I ended up using the sketch version instead, postponing the creation of the high-quality digital version. When I did finally resume work on the digital logotype, I started by overlaying vector shapes on top of the imported sketch and then focused on adjusting proportions, kerning, and symmetry—since my right-handedness caused the initial hand-lettered text to be a bit skewed. This involved a lot of back and forth because the end result had to work well in different sizes and mediums (e.g. paper, wood, glass, textile). Once the finishing touches were in place, the toughest part of the project was done and I was ready to focus my attention on packaging, merchandise and web design. 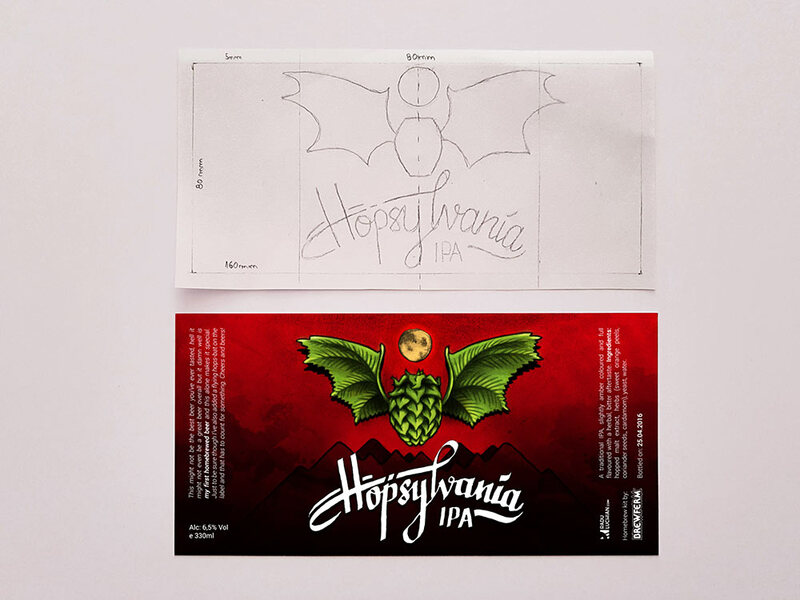 Knowing what the logo would look like allowed me to make progress on the rest of the label design by focusing on the other elements: hops bat, moon, background, and colors. 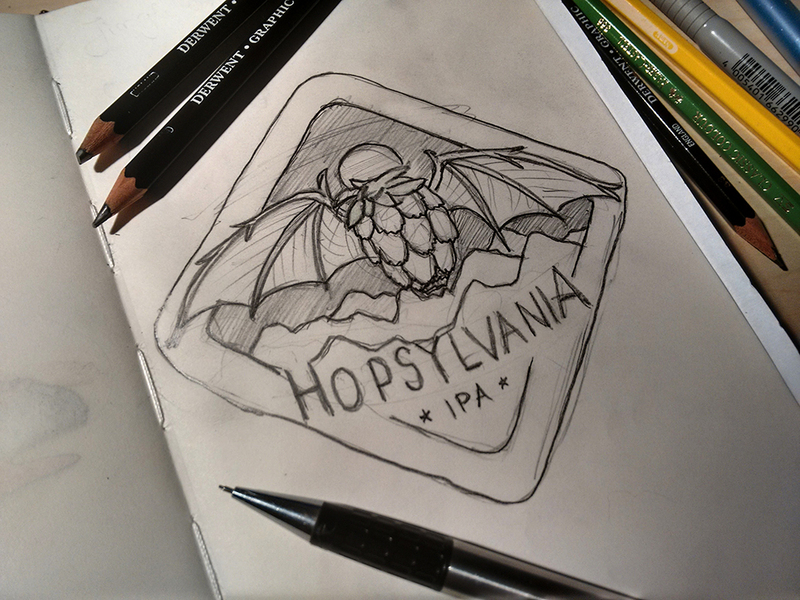 Since I’m always more comfortable with the pencil rather than the pixel, I just went into a full sketching session and before I knew it I had myself a grayscale sketch of the bottle label at more or less the right proportions. As mentioned earlier, by this point I didn’t have an actual vector version of the logo, so I just used a slightly polished scan of the logotype sketch whose proportions I still had to figure out. I did this by measuring one of the bottles and making a blank placeholder label. This allowed me to test the optimal viewable area of the bottle and write down measurements. Based on those measurements I proceeded to split my sketch into separate layers in Photoshop (i.e. bat, moon, mountains), which I could then scale to fit that viewable area perfectly and later add colouring and blending. 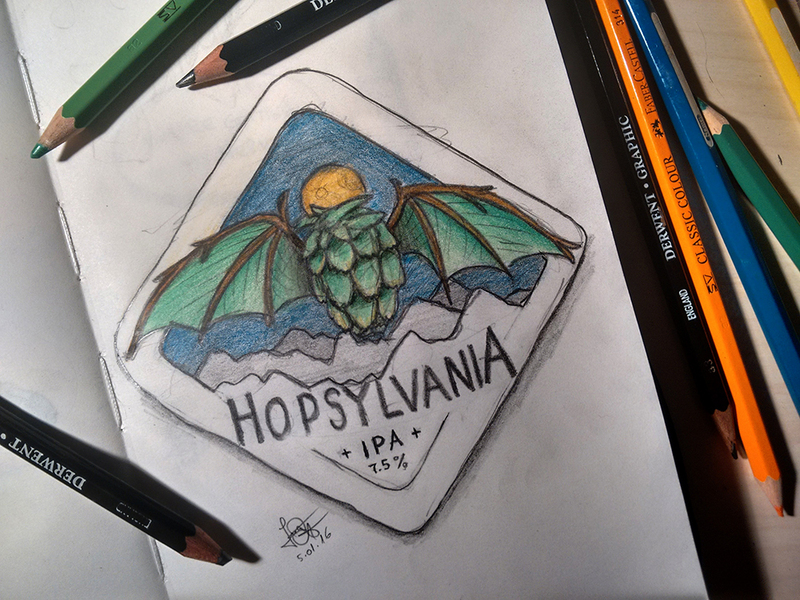 This is how for my first homebrew batch ended up having a digitally colored sketch as a label. 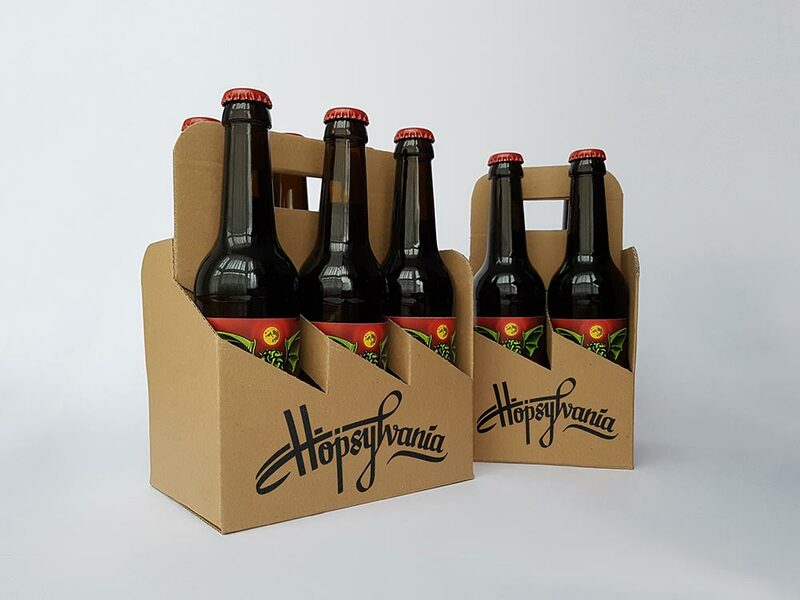 By this point Hopsylvania had become more and more my own personal project with which I wanted to experiment and learn, both in design as well as in homebrewing. I wanted to use it as a catalyst for working with techniques and tools that I hadn’t worked with in a very long time as far as design goes: branding, illustration, packaging, print. 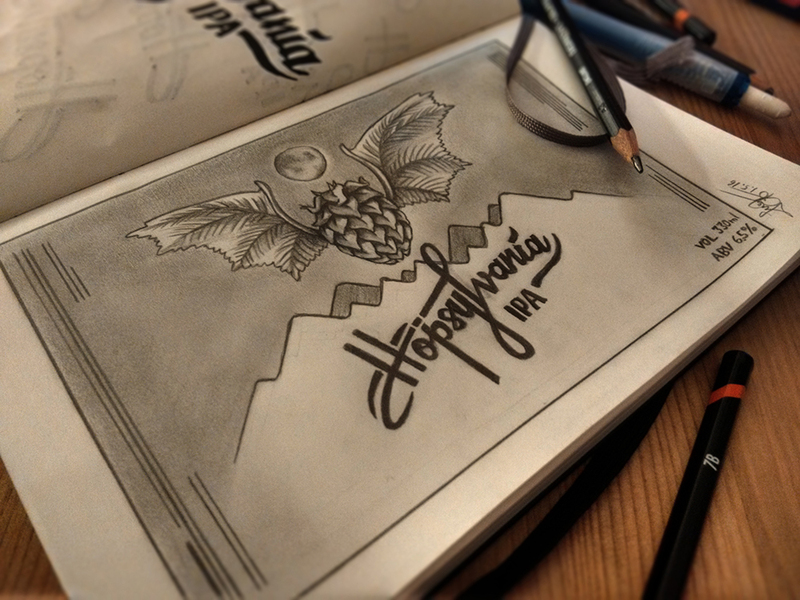 The goal now was for Hopsylvania to become an actual brand for any of the beers that I would brew at home. 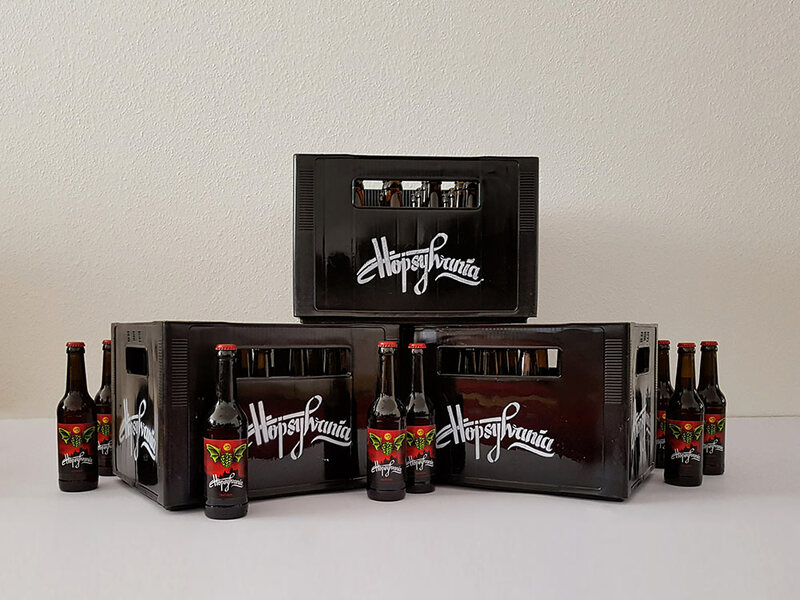 This meant having a strong identity that would work well in all the different mediums in which it would be used and the goal was for the bottle label to become the main promoter of this brand. Reaching that goal required me to focus a lot on details and come up with a high quality graphic for the labels. 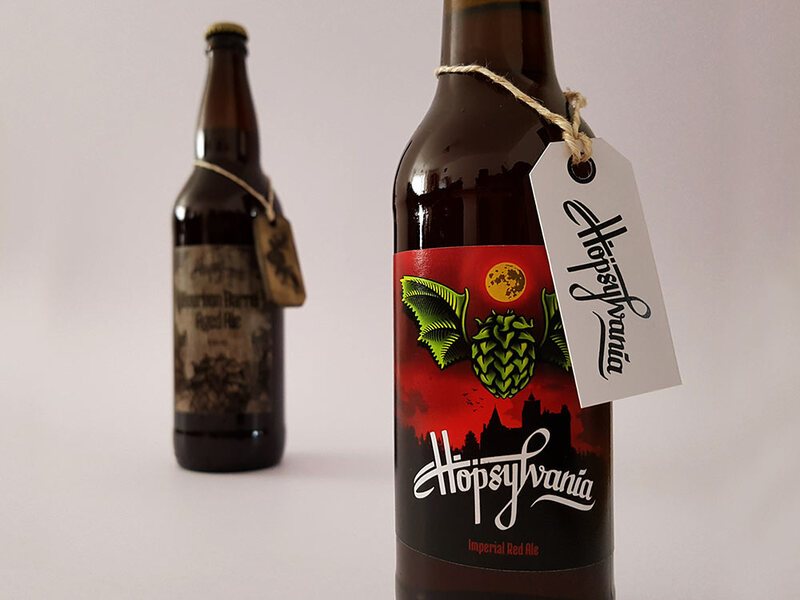 And what better way to start this than focusing on the face of Hopsylvania: the hops bat! I redrew it completely in Illustrator and then proceeded to colour and blend it in Photoshop alongside the red Transylvanian background. Because I wanted the design to be true to its name and have that Transylvanian vibe, I chose elements that resonate this in the most authentic yet minimal way possible: mountains, forests, and castles. And speaking of authenticity, for the castle in the background I actually created a silhouette of the original Bran Castle—also known as Dracula’s Castle. 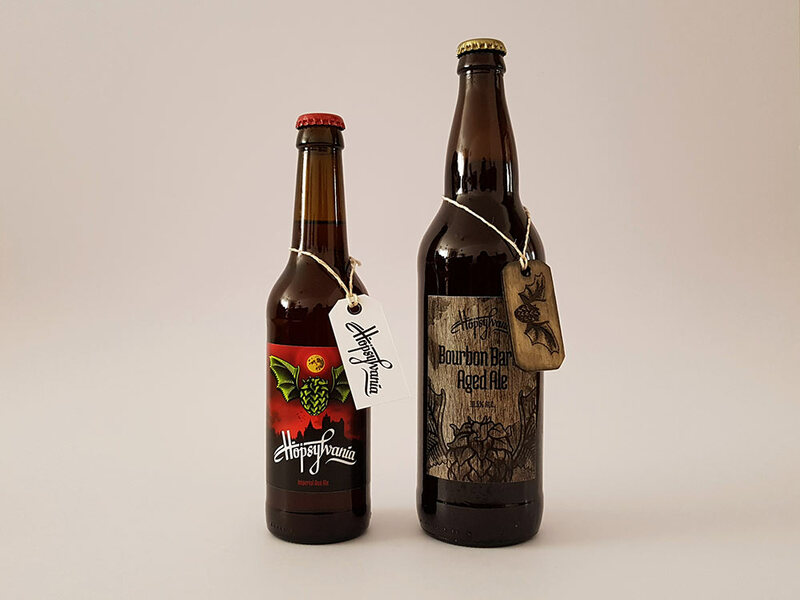 With the design part done, it was time for printing, cutting and applying the labels on the botttles. Since my second beer batch was bigger, I ended up with around sixty bottles that needed labeling and despite spending up to two hours manually applying all those labels on the bottles it was well worth it seeing them all lined-up. Red Ale: red as the implicit brand color. 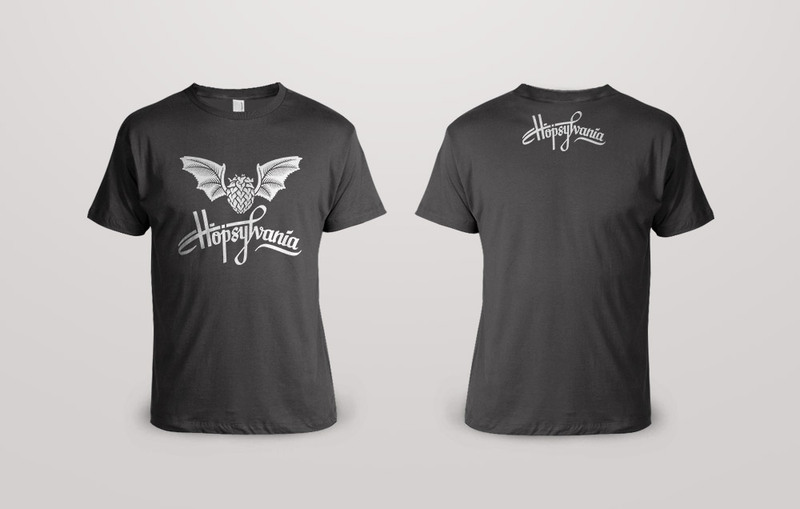 Imperial Stout: purple to suggest royalty. IPA: bright-green as the color of intense hops. Golden Ale: orange-gold as is the beer color. Brown Ale: brown as is the beer style. Witbier: light-gray to remind of wheat tones. Fruit / Lambic: pink as wild berries. Though a simple solution, the visual impact of all the different labels next to each other is pretty awesome. 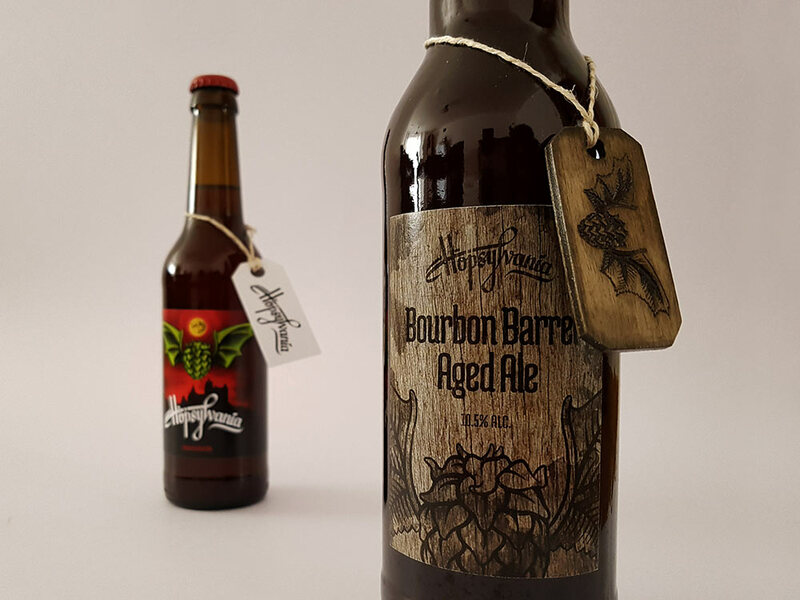 Since I was experimenting with labels, I even took it one step further and created a smaller wooden textured label to be used on larger 660ml bottles—you can see this below in the “Tags” section. This one I figured would go nice on a barrel aged strong ale for example, not that I would ever be able to make one anytime soon. One of the things I like most about home brewing is when I get to share some of my home-made beer with friends. Be it at my place or on the go, it’s always fun to take out a bottle and notice people’s reactions when they see the packaging and realize it’s actually brewed, bottled and branded by me. 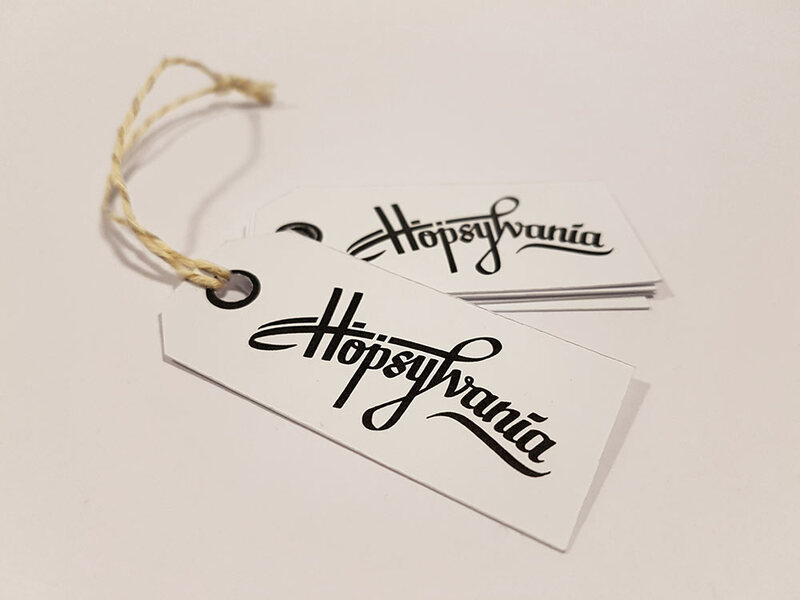 That being said, I wanted to make the act of offering one of my beers to someone even more special, and I did that by printing tags on heavy weight matte paper with a very minimal design. On these I could write a few words, a greeting, a joke. The design is as simple as the messages I usually write on the back, but the personalized factor makes it all the more appreciated. 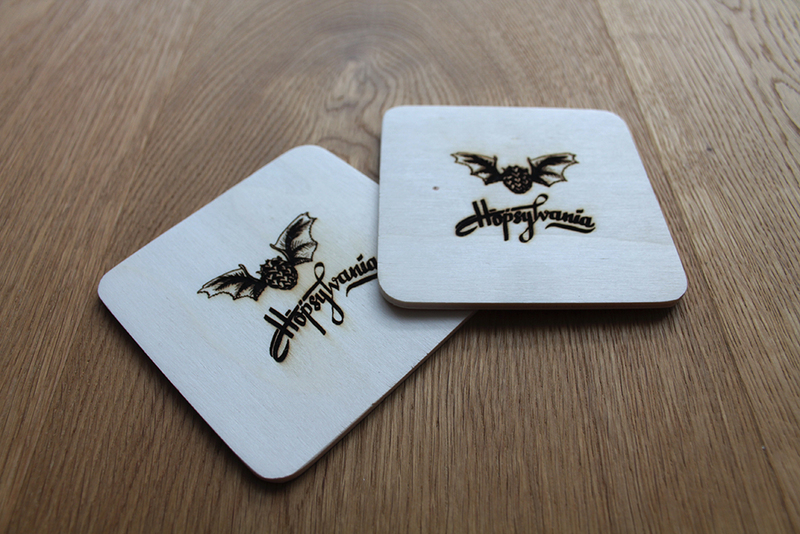 As you will find out below, I even experimented a bit with laser engraving on a couple of wooden coasters. 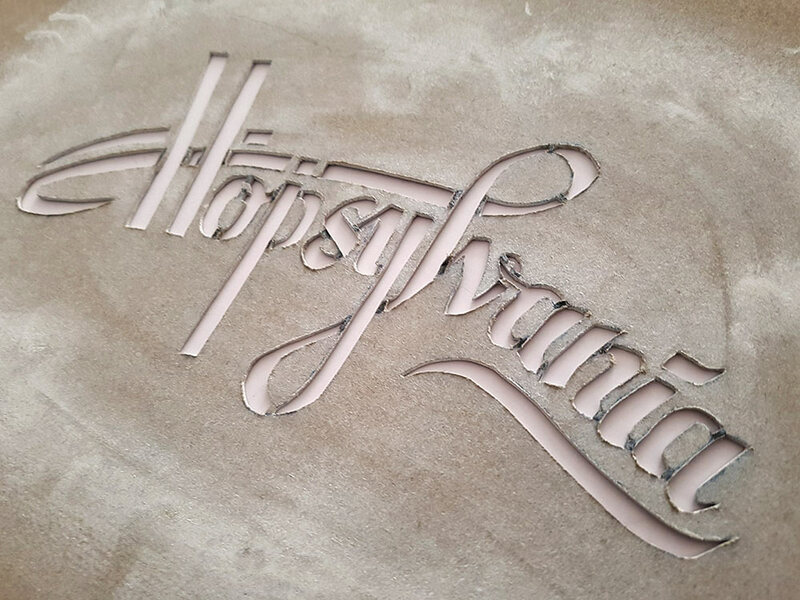 Unfortunately for me, I misaligned the machine when engraving the first coaster—of which there were supposed to be three—and the hops bat ended up misplaced. Not being one to waste that still beautiful engraving, I resorted to cutting it out with a fret saw and turning it into a wooden tag. 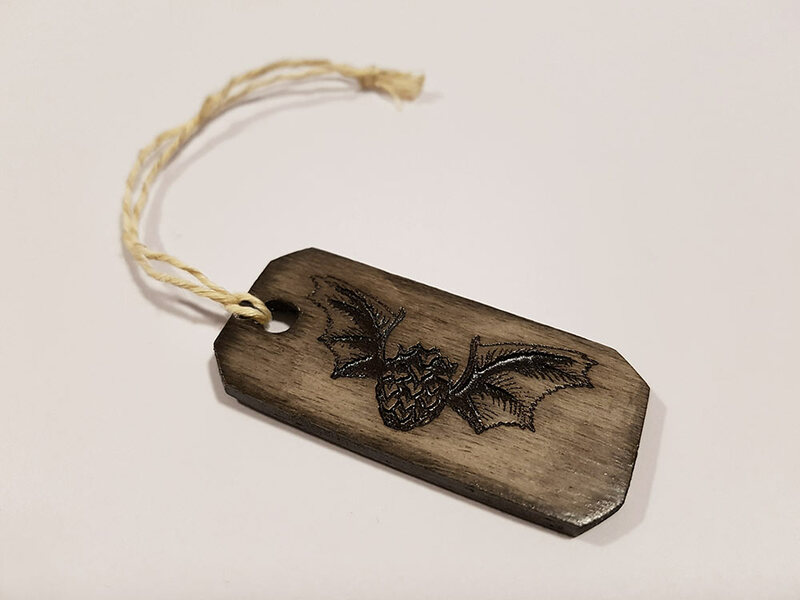 In fact this accidental tag was created even before the rest of the paper tags, but even at that stage I figured it could some day make a nice accessory either as a keychain, around the neck of a fancier beer bottle or who knows where. The point being that since this was going to be a branding project, any idea was worth puttin a pin on. When I bottled my first beer almost half a year ago I made sure to put a few bottles aside for comparison and stored them in the cellar in a cardboard 6-pack. Altough I didn’t like the branding on the 6-pack I did like its clean design and sharp angles, so I tried to order some for myself. As luck would have it, I couldn’t find anything matching that particular design or a least not in small quantities, so i decided to make my own. I reverse engineered the template for that 6-pack and used it to make my own. While I was at it I figured it was also a good idea to adapt the template to a 4-pack version, for when I’d want to carry less bottles around. Having made the cardboard cutouts for both sizes, I then glued them and lettered in the logotype to finalize the design. When I brewed my first beer batch it proved quite a hassle to move all the bottles around. Though I kept them in one large sturdy cardboard box, I was aware that this was going to be just a short-term solution. By the time I had started brewing my second batch however, I had already found myself three nice plastic crates that would solve this problem. The crates were black right from the start, but had some white logo serigraph printed on each side. 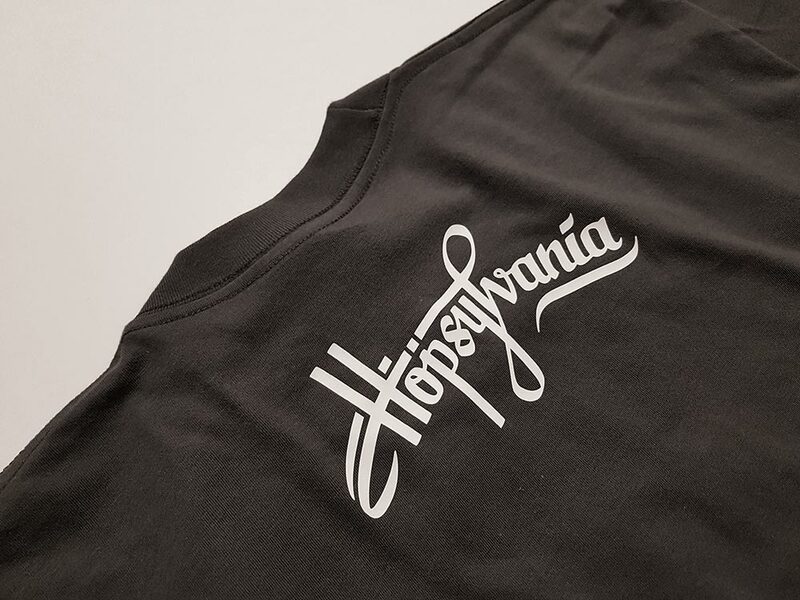 Because I would have preferred them unbranded—or at least custom branded with my own design—I bought some spray paint to cover up the old logos entirely and stencil in my own Hopsylvania logotype. After a bit of trial and error with choosing the right paper for the stencil template, I finally had the cut-out ready for spray painting. Having gotten rid of the old branding with a coat of black paint, I could now apply the logotype stencil to make them my own, and even if the end result was far from factory quality, it was just enough for me to experiment with some of the common packaging types. Though I was considering the idea of printing some coasters while sketching that initial square prototype mentioned in the beginning of this article, I never actually allowed myself the time for this in any of the design stages. As luck would have it however, things would get even a bit more interesting for Hopsylvania as far as coasters go. 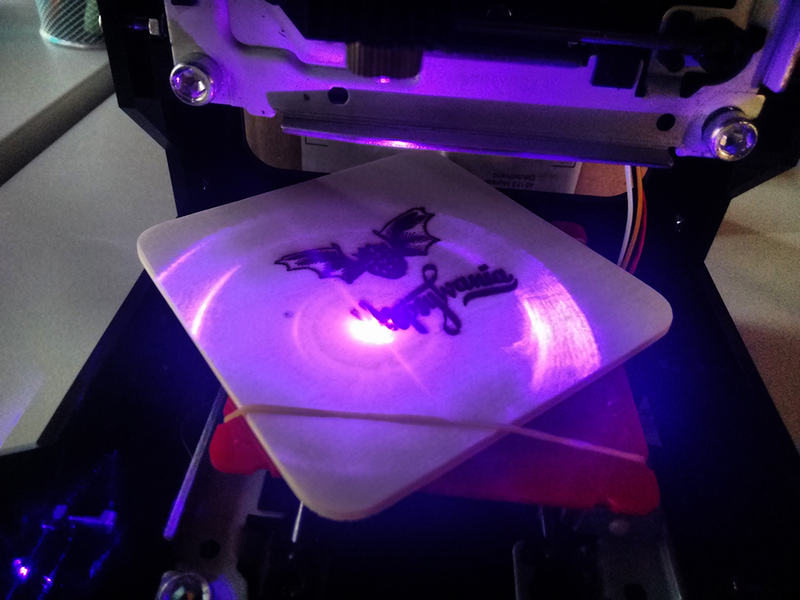 A colleague of mine from TrustYou had recently purchased a laser engraver and was actually showing me a small engraving he had made on a piece of plastic. 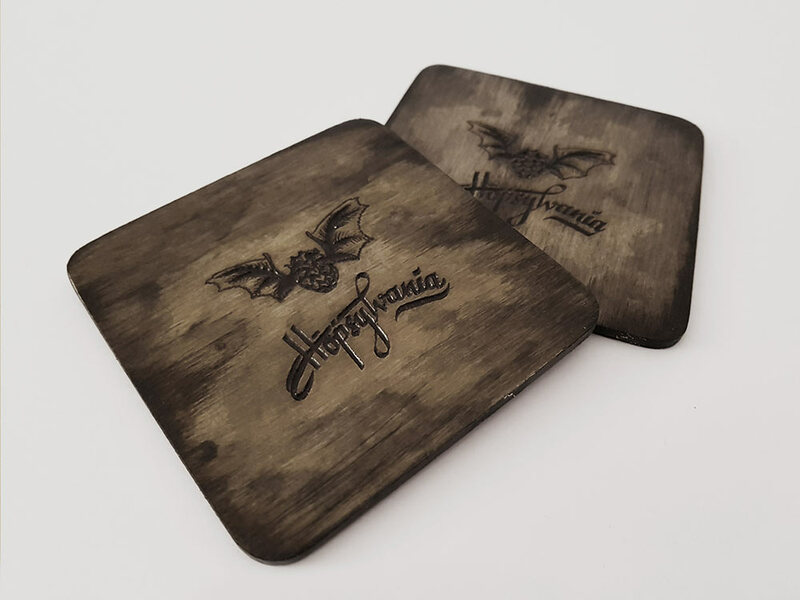 Having done a bit of pyrography myself when I was younger as well as having recently created my own wooden coasters with a fret saw, it naturally dawned on me that we could use this as an opportunity to create some beautiful coasters. With that in mind, I prepared three blank linden wood pieces in standard coaster size of 90x90mm and brought them over the very next day. 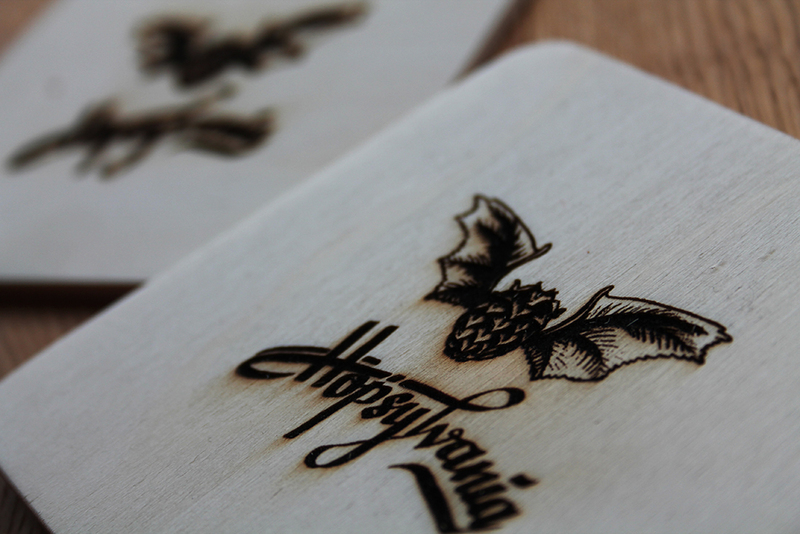 At only 38x38mm, the burnable area was fairly small so in order to make the most of it I had to apply my graphics across the diagonal of that square and do the engraving in two separate parts: one for the hops bat and one for the logotype. It took around 20 minutes to engrave each part of the graphic and that was the first time that I worked with a laser engraver. As mentioned earlier, the hops bat on the first coaster had been misaligned and ended up in one of the corners instead of the center. This wasn’t all bad since I ended up turning it into a wooden tag. 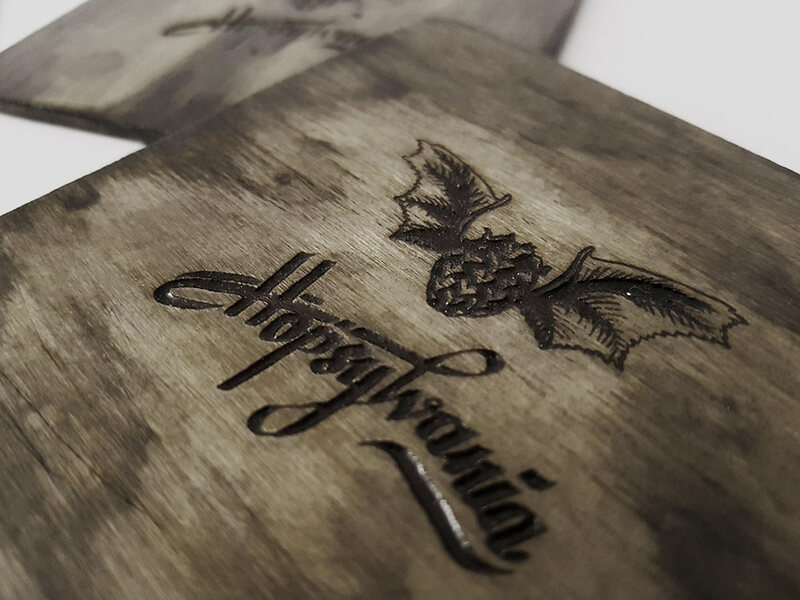 Because laser engraving wood produces a bit o smoke around the laser-wood contact point the laser beam can end up slightly refracted and this causes a lower “resolution” on the engraving (i.e. you end up with a fuzzier burn). Having never used acrylic matte varnish before, I ended up applying about three layers of it and then sanding it all off from both coasters. This was because the wood fiber looked too dull and I needed to first stain the wood for that extra effect. By the time I had stained the wood, I realised that one coaster was engraved along the wood fiber while the other one was across the fiber. This became fairly prominent especially when the stain pigments got into the wood fibers. Even with all those mistakes, this was still just an experiment and I think by the time I was done with the coasters I managed to salvage them completely. Using a sponge I stained the wood to give it that vintage look and once I was happy with that I applied a few coats of varnish to protect it from spills or condensation from the glass/bottle, without making it too shiny. Some of the very first products I created as a designer have been T-Shirts, so for this project I was definitely considering making myself one. My only concern was that I wanted control over where and how the shirt was to be sold, so this meant submitting the design to an online shop where I would have such flexibility. Having already opened a shop at Spreadshirt awhile ago, it was convenient for me to upload some of the finished graphics and configure the new product. Despite being a bit nervous of how the design was going to look like on textile, I was pleasantly surprised once the test shirt was delivered. 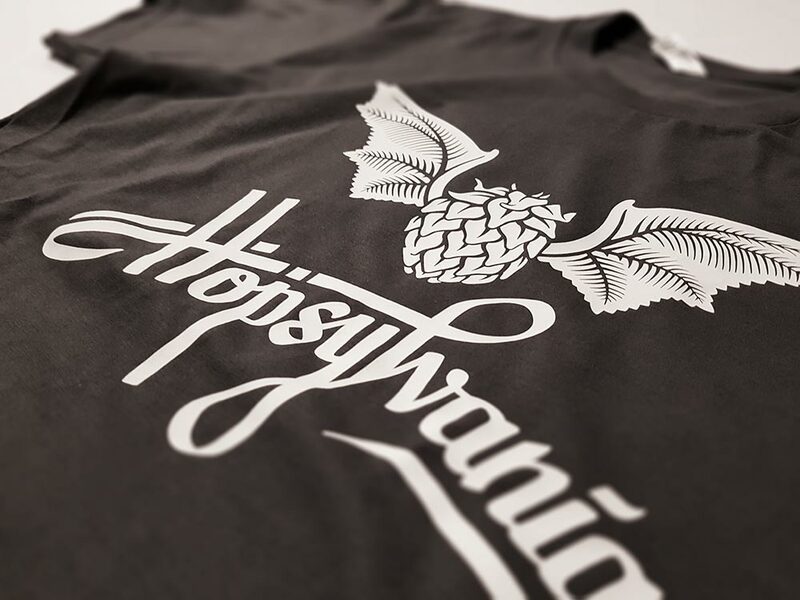 The high quality white flex print had good contrast with the asphalt cotton shirt, making the details in the hops bat stand out nicely. Since it was relatively easy to set this up, I figured it might be a good time to see how the design looks like on other pieces of merchandise. With that in mind I also went ahead and created some other apparel in my Spreadshirt shop, from tank tops and long sleeve shirts right down to small buttons. 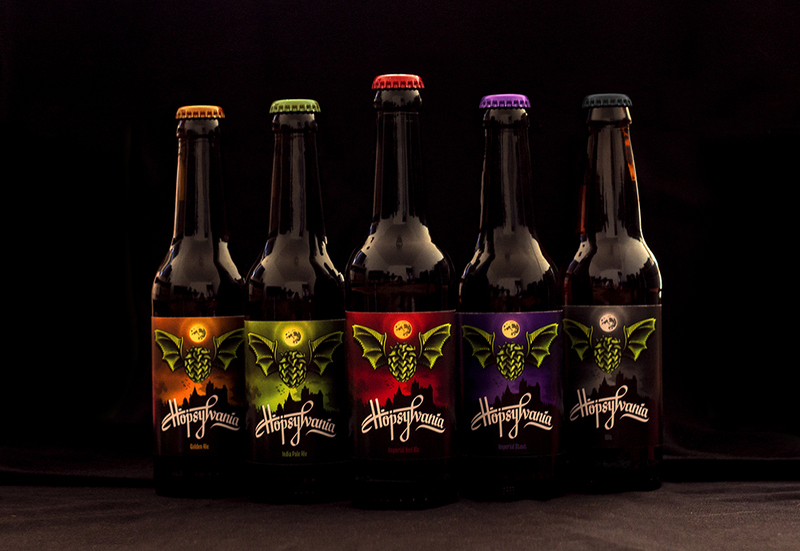 A brewery website to showcase the brand, packaging and beers. An official Untappd account to allow for the beers to be checked-in. 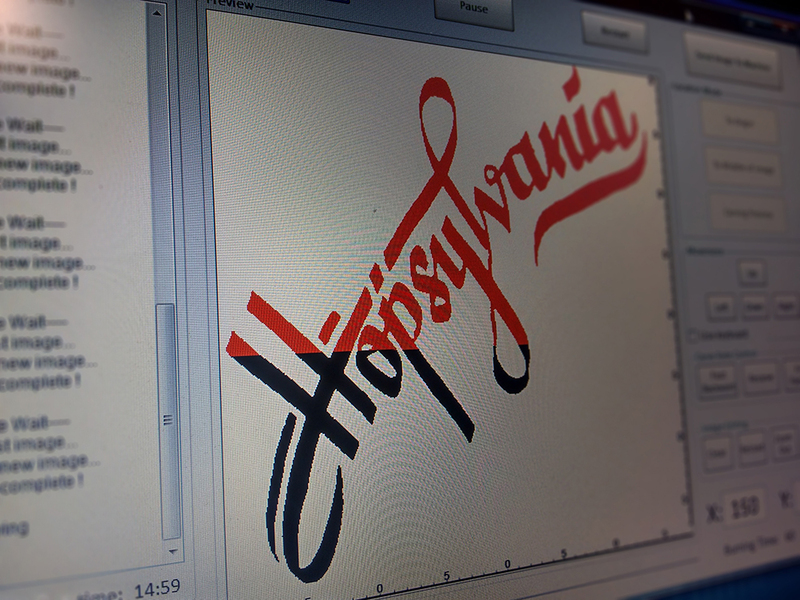 Designing the Hopsylvania website was actually a bit of a playground for me, especially in its early stages. 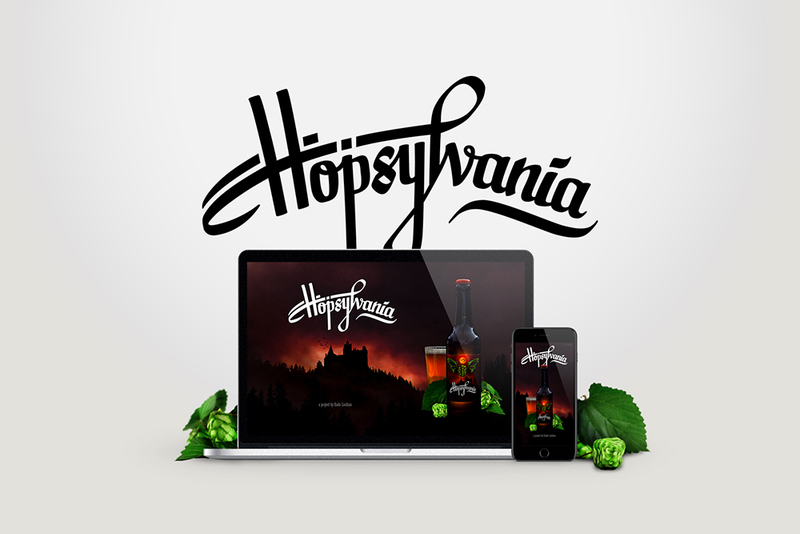 Actually at that point the only content I had on it was a splash screen with the logotype, a stylized photo of the beer bottle and the Transylvanian background graphic, which would later be used on the final beer label. 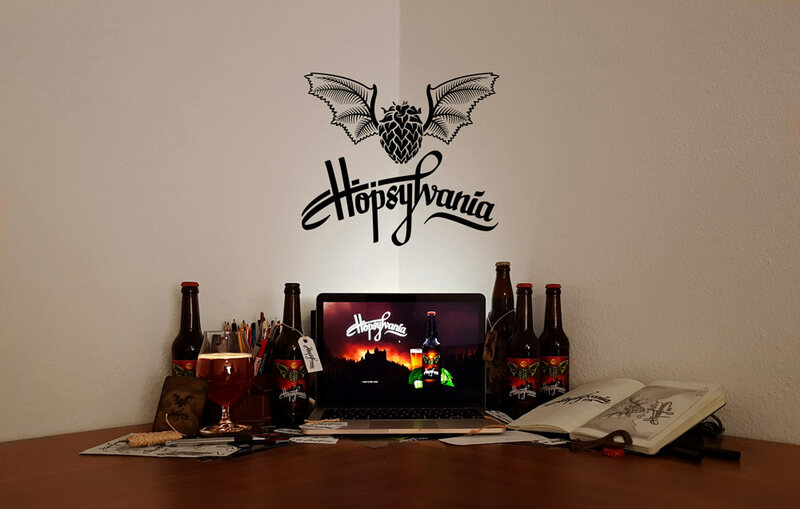 The end goal with this was to create a single page website that tells the story of what the project is about, what beers I made so far and why I chose to invest so much time in branding my beer. The design had to be clean, modern, stylish and informative enough without going overboard with content that didn’t make sense. This was the opportunity for me to apply my creative thinking in a web project that is in no way restricted by company styleguides or pre-existing code bases. 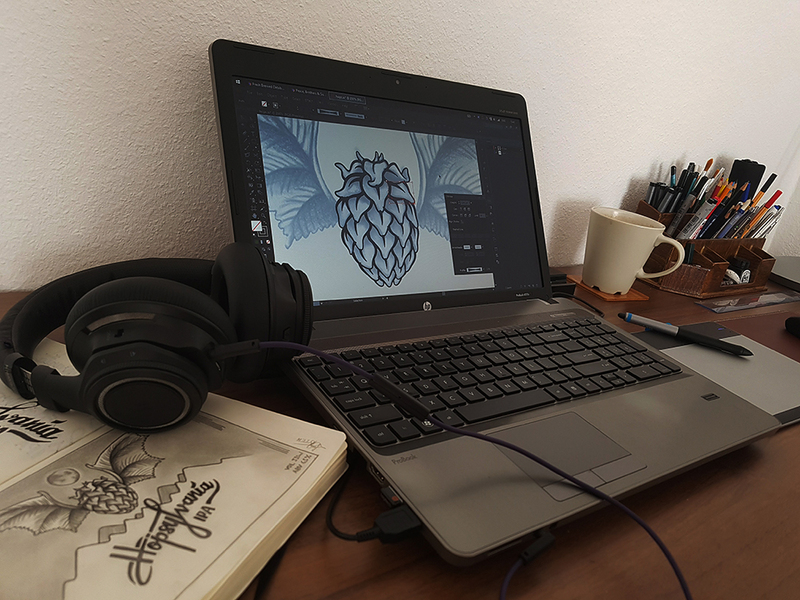 From product photography and copywriting, to photo manipulation and full-page content blocks, this was a clean slate on which I could experiment, learn and improve as a designer. 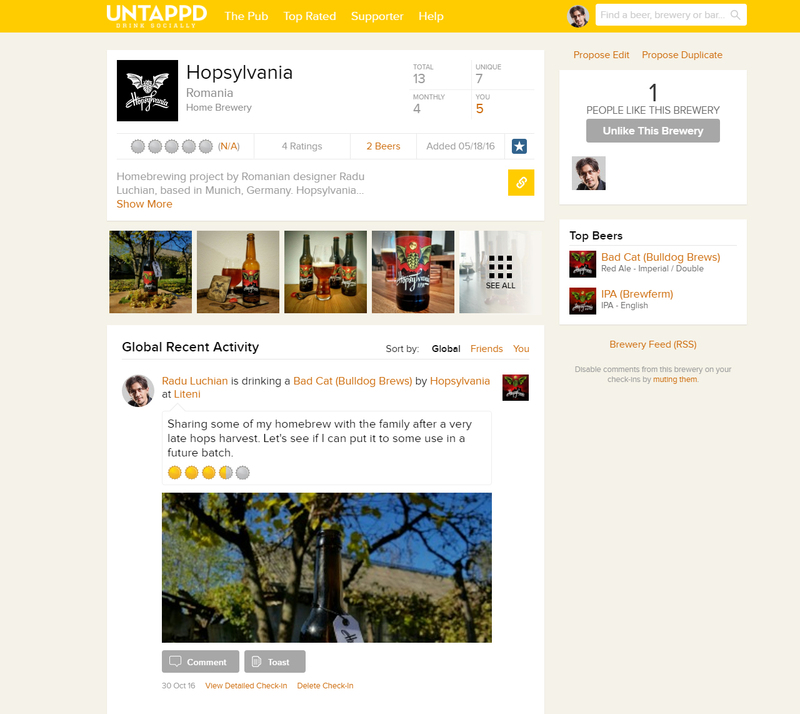 For those of you unfamiliar with it, Untappd is a social network tailored for beer enthusiasts. I won’t get into too much detail, but think of it as a sort of Foursquare for beers: you drink a beer, snap a photo of it, give it a rating and publish it at the venue you’re at while your contacts get notified and can virtually toast your check-in. IPA (Brewferm): using the “IPA“ kit from Brewferm. Bad Cat (Bulldog Brews): using the “Bad Cat“ kit by Bulldog Brews. Perhaps at some point in the future I will be able to play a bit more with my own personal recipes and create my own beers. For now though, I still have quite a lot to learn, hence I will be sticking to brewing kits for a while and the Untappd check-ins are going to reflect that. 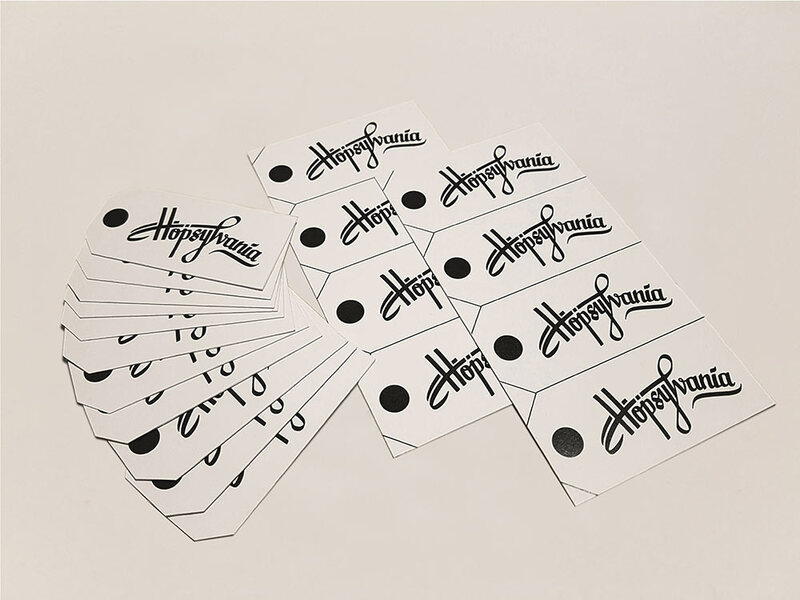 What started off as a label idea for a close friend ended up a full-blown branding project that required time, dedication, creativity and patience. As far as working on the different parts of the project, some things overlapped more and some things less in terms of allocated time. Needless to say that I have learned a heap of things since that first sketch two years ago, not only in regards to brewing but also as far as design goes. I worked in a decent mix of mediums—digital, paper, wood, plastic, glass, textile—with a lot of different techniques—drawing, vector, digital painting, photo manipulation, photography, copywriting—to obtain several deliverables—logo, print, shirts, illustration, website. 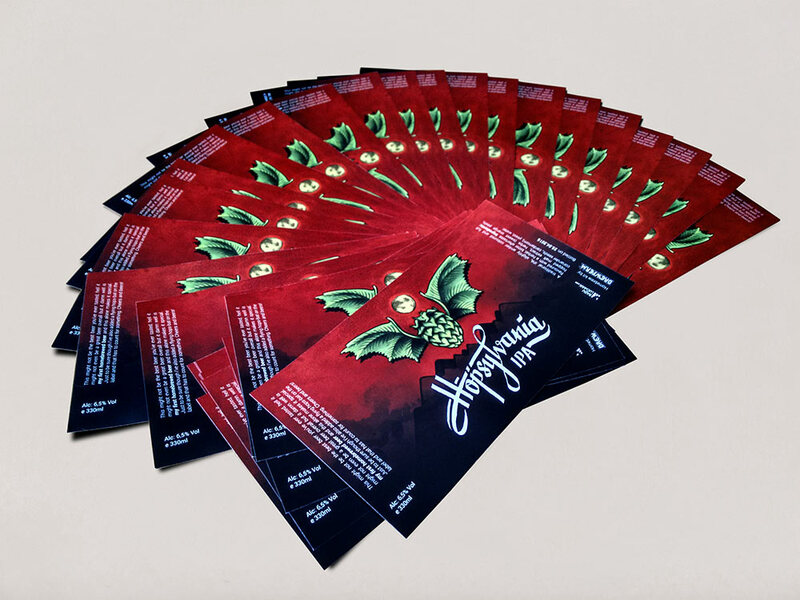 I loved working on this project because I love beer, but most of all I loved working on it because it was the sum of everything that made me the designer I am today. Cheers and beers!